Awards @ Awarded “GOLD Category – eCommerce” by International Quality Summit Award. 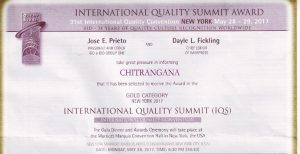 Pleasure to share, selection of “Chitrangana” by 31st International quality summit award (IQS), New York under GOLD category – eCommerce. The award ceremony organised on 28th-29th May 2017 in New York, USA. The 31st International quality summit award organised by International Quality Convention and Imarpress Group. The award chaired by Jose E. Prieto (President and CEO, BID and BID Group One) and Dayle L. Fickling (Chief Editor of IMARPRESS).